Beautifully maintained 4 bedroom 3 1/2 bath townhouse located 2 Blocks from the Atlantic Ocean and Ocean City's famous Boardwalk. This unit includes a 2 car garage on the first level and an assigned parking spot right outside of the garage (3 parking spaces total). This elegant unit is located right in the heart of Downtown Ocean City and walking distance to major attractions. You will not be disappointed. Restaurants, Golf, Recreation are all within walking distance. 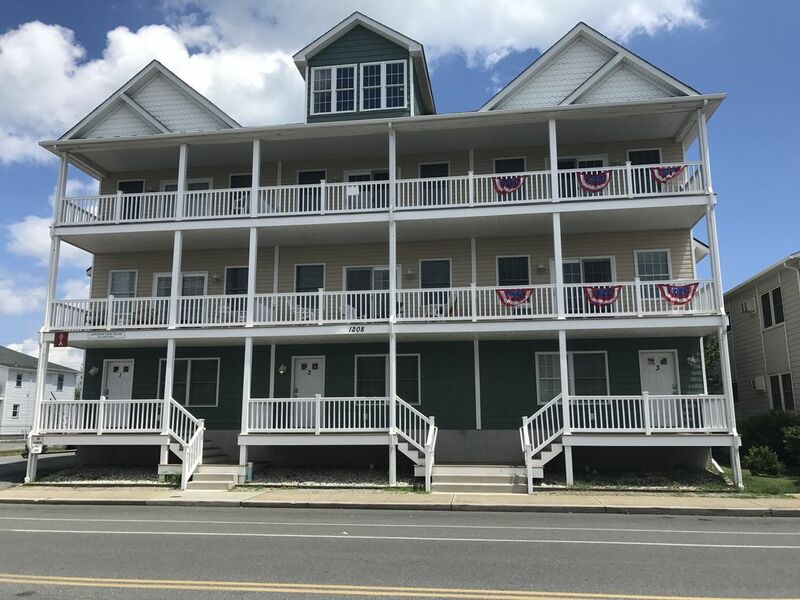 Captains View Vill is a complex with 6 other units that can be rented for team and sports events, family reunions, OC Events, or just a getaway at the Ocean! From the 4 spacious bedrooms to the three full and one half bath, it is clear that this unit has everything that you could possibly need. The kitchen is fully equipped and you can prepare gourmet meals for small or large crowds. Service for 12+, coffee pot, blender icemaker, 4-slice toaster, crab knives/hammers......this place has it all. State of the art technologies are installed throughout the unit, including flat screen TV's in every room with High Definition Service, private WiFi, Sound Bar w/IPod docking station, charging stations, power strips....you get the idea. You won't have to search for an outlet to charge up here. There has been attention to detail throughout this unit. The paintings are original works, there are hooks to hang things, an place to hang up your keys, lots of mirrors, chairs on each balcony, places for everyone to sit together and the layout is perfect for large gatherings. We purchased this home so that everyone can build Ocean City Memories. My wife and I have vacationed in OC throughout our lives, including our own senior week. We know what it takes and will do everything we can to make your Ocean City Beach Vacation a lifetime memory. It's FABULOUS! 2 blocks from the beach, 2 car garage and one assigned parking space. Never use your car after you arrive. Many good places to eat and entertainment can be found within a 5 or 10 minute walk. 6 minutes from your front door to the Ocean and Ocean City's famous boardwalk. 20 minute walk to the inlet gives the perfect way to walk off Thrashers, Dollie's, Fishers and Dumsters. It's really the perfect distance. Just close enough to be near everything fun and exciting...just far enough to provide some privacy and quiet. Rentals available nearby & often a boogie board or two in garage. This unit is within walking distance of White Marlin Week activities. Golf Courses short drive & Mini Golf within walking distance. Loved everything about this place, had the best time. Plenty of room for my family and a beautiful house to stay in. I definitely plan on staying here again. It was great to be within walking distance of the beach and boardwalk. Very clean and nice to have 3 parking spaces was just perfect. Excellent experience!! Perfect location for everything we had wanted to do and enough room for us. Thank you for renting with us this year and for the 5 star review. We strive to maintain this unit in tip-top shape and are happy that you had a great time. We stayed here for one week in July and the house is just beautiful. Just moments away from the boardwalk and bay this house is ideally located. The house is spacious and lovely. We were five people that comfortably stayed here. I highly recommend renting this townhouse. Thank you for the outstanding review and for staying with us in 2018. We strive to keep our unit in top condition and make improvements each year. It was a pleasure to have your family stay in our unit and please return when you are in OCMD. Enjoy the remainder of your summer. Thank you for the great rating and review. It was a pleasure to host your group. Great get-a-way, great location, great owner to deal with!!!!!!!!!!!! Great location, Nice place, roomy,Owners are very nice people and great to deal with. Thank You! This is a great location. 12th street is in the heart of everything, yet just far enough to provide some privacy. OC Has It All! M.R. Ducks, Purple Moose, Playland, Phillips, Dollie's, Dumsters. Great location for friends and family to celebrate and make Ocean City memories.